I have a new set of free digital paper for you! 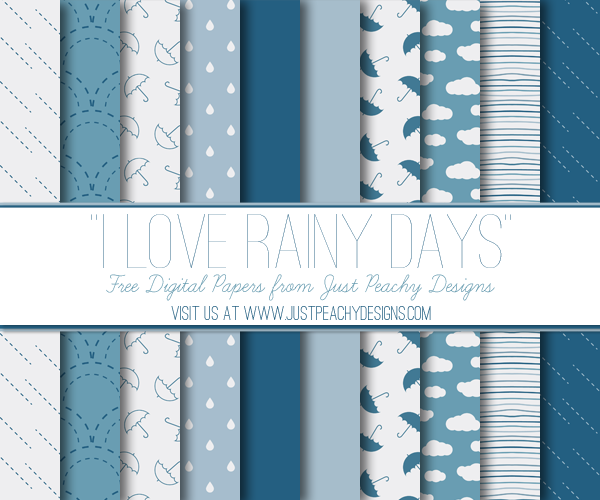 This set of 12x12 inch papers has a rain theme and features clouds, umbrellas and raindrop patterns which I downloaded for free from Freepik. If you're not familiar with Freepik, go check them out - they have tons of really awesome graphics that are totally free to download. Anyway, just click the image above to download. Feel free to use these papers for any scrapbooking, crafting and digital design projects. You can also use them commercially, just please provide credit to Just Peachy Designs and include a link back to this website. I read your blog very useful to me. Thanks for sharing it. Video games can be a fabulous way to get exercise these days. The gaming industry is creating more and more full body experiences, thanks to modern technology that can sense your movements. This means your body can be used to play the games for all types of things like yoga or sports. You can exercise and play at the same time.